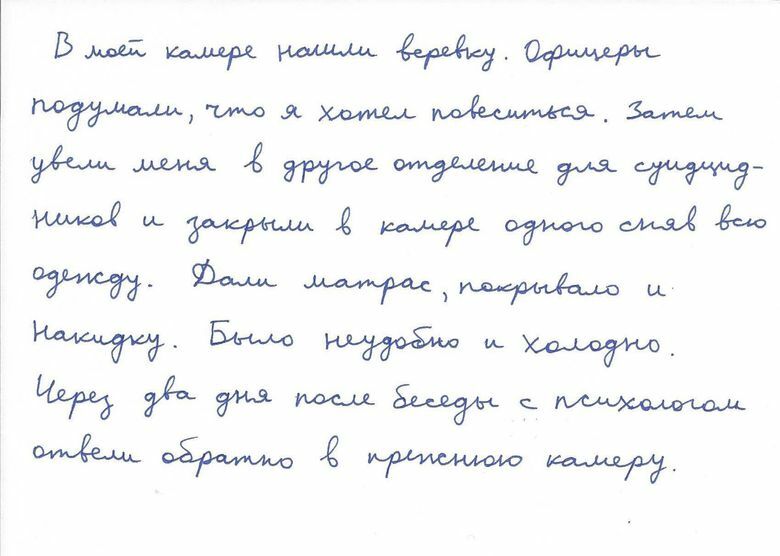 In this note, written in Russian, asylum-seeker Mergensana Amar gives his account of how he was treated at the Northwest Detention Center in Tacoma. The note was written three weeks before Amar was taken off life support after he tried to hang himself. Was a Russian detainee thrown naked into a cold cell before he tried to hang himself in the Tacoma detention center? A handwritten note raises the possibility, and the case is drawing international attention. Three weeks before Mergensana Amar was taken off life support after attempting to hang himself inside the Northwest Detention Center, the Russian asylum-seeker and one-time hunger-striker wrote down something important he had been trying to tell a lawyer. He and attorney Sarah Leyrer had trouble communicating when they met Nov. 3 in a private room of the Tacoma facility. “There was a lot of pantomime,” recalled Leyrer, a city of Seattle staffer who has been visiting detainees outside work as a volunteer for the activist group Northwest Detention Center Resistance (NWDC Resistance). It was the liveliest she had seen Amar. In two previous short visits, he had been withdrawn, eyes downcast. “Can you just write it down?” she finally asked him. Later translated, the short note offers clues into what the 40-year-old detainee was going through before his death, and raises just as many questions about a case that is drawing attention from the governor, members of Congress and international media. At issue are longstanding concerns about conditions — particularly medical and mental-health care — inside the country’s facilities for detained immigrants, where 74 people have died since 2010, according to federal reports cited by Human Rights Watch. “They found a rope in my cell and thought that I wanted to hang myself,” Amar wrote, according to a translation by University of Washington professor of Slavic languages and literature Galya Diment, who concluded from the grammar and neat handwriting that he was an educated man. The note may not be as simple to decipher as it appears — and U.S. Immigration and Customs Enforcement (ICE) spokeswoman Tanya Roman declined to answer questions about it until an investigation by “appropriate parties” is concluded. Pablo Paez, executive vice president of the GEO Group, the corporation that contracts with ICE to run the detention center, referred questions to ICE. Little is known about Amar, other than that he came from the Siberian republic Buryatia and arrived at the border at San Ysidro in San Diego on Dec. 2 last year without immigration papers. Attorney Liya Djamilova, who represented him at an Aug. 7 hearing, said she couldn’t discuss details of his case due to confidentiality rules that continue after death. Something about him seemed “off” and not entirely rational, Djamilova said. But he had a good case for asylum in her view. An immigration judge nevertheless denied his request to stay here. Amar could not afford to keep paying her, she said, but he apparently filed an appeal on his own. The Board of Immigration Appeals ruled against him Nov. 2. The very next day came the meeting with Leyrer and his handwritten message. NWDC Resistance activists say it reveals that officials put Amar in a cold, isolated cell naked — evidence of deplorable treatment they allege led to his Nov. 15 suicide attempt, and death nine days later. “ICE is responsible,” said Resistance organizer Maru Mora Villalpando. Stern assumed after being read Amar’s note that he had been put into what’s known as a “suicide smock” — a long covering made of thick, tear-free material referenced in the federal standards. Such smocks open up and can be spread flat, so perhaps Amar confused it with a blanket, Stern speculated. Diment said a word in the note could be used either for a blanket or something to perhaps throw on a bed, so it could have been referring to a smock. Even if Amar had a smock, it apparently wasn’t keeping him warm, though. And was an isolated cell the best place for him? “It’s not therapeutic, if you’re suicidal, to be stuck alone in a cell for hours and hours at time,” said Grace Meng, a Los Angeles-based lawyer who has researched detention centers around the country for Human Rights Watch. A 2017 report by that organization analyzing 15 recent detainee deaths describes three cases of detainees who died by suicide after being put in solitary confinement. A two-day lapse before a psychologist’s visit, as described by Amar in the note, struck Stern as a long time, although probably not outrageously so. Federal standards require that a detainee believed to be suicidal be “immediately” referred to a mental-health professional. If isolation is deemed needed, the detainee should receive welfare checks at least every eight hours and daily mental-health treatment. The person should also be placed in a medical unit, and isolated elsewhere only “as a last resort,” according to the standards. ICE places in segregated areas detainees who are being disciplined or who they judge need to be protected from other detainees. Amar’s note did not indicate where exactly he was placed. In September, though, Meng visited the Northwest Detention Center over two days and met with a number of detainees, including several who had been on a hunger strike. Such protests have swept through the facility for years, carried out by detainees upset over what they say is abysmal food, sometimes abusive treatment by guards and $1-a-day pay for those who work — the latter the subject of a lawsuit by state Attorney General Bob Ferguson against GEO. One hunger-striker Meng met, she said, was another Russian immigrant who told her he and Amar — who stopped eating in August — were then being held in the medical unit. He was also extremely weak and dizzy, and spending most of his time in bed, according to the filing from Dr. Sheri Malakhova. According to ICE, Amar began taking electrolytes, fresh fruits and shakes later that month. Activists say his hunger strike continued on. How long he stayed in the medical unit, where he went directly after, and what treatment he then received are all unclear. But a Honduran detainee who was in a solitary-confinement cell used for discipline, Jayson Martinez Juarez, has told two lawyers, including Leyrer, that Amar was being held next to him for months — including Nov. 15, the day the Russian attempted suicide. An ICE statement said Amar was in “voluntary protective custody” at the time of his death. (He died in a Tacoma hospital on Nov. 24). It also said before his suicide attempt “he remained in good physical health” and “was monitored daily” by ICE medical professionals. Gov. Jay Inslee on Wednesday sent a letter to Homeland Security’s Acting Inspector General John Kelly asking for an independent inspection of health and safety conditions at the detention center in light of Amar’s death. U.S. Sens. Patty Murray and Maria Cantwell, and Reps. Adam Smith and Pramila Jayapal, all Democrats, sent a similar letter to Kelly on Thursday. The four members of Congress asked, in a different letter to ICE’s top official, for detailed information about Amar’s death, including a timeline of where he was placed in the detention center, and what medical and mental-health care he received. ICE, famously closemouthed, has offered no details of what investigation it will do.